To our American friends, supporters and alumni, I would like to wish you all a happy Thanksgiving. I am currently travelling around the US on an end of the year fundraising trip and will spend Thanksgiving with my sister and her family for the first time in 19 years. While on this trip a number of people have inquired as to whether my family and I celebrate Thanksgiving in Israel. I believe that it is fairly common for US expats to celebrate Thanksgiving. My family and friends do as well, though not necessarily on the fourth Thursday of November but whenever it is convenient to get together. Some years we celebrate Thanksgiving in December, sometimes in February and one year we ate turkey in April! There are many days in the Jewish calendar when we have the opportunity to give thanks, so I will admit, for my family, it is really about the food. 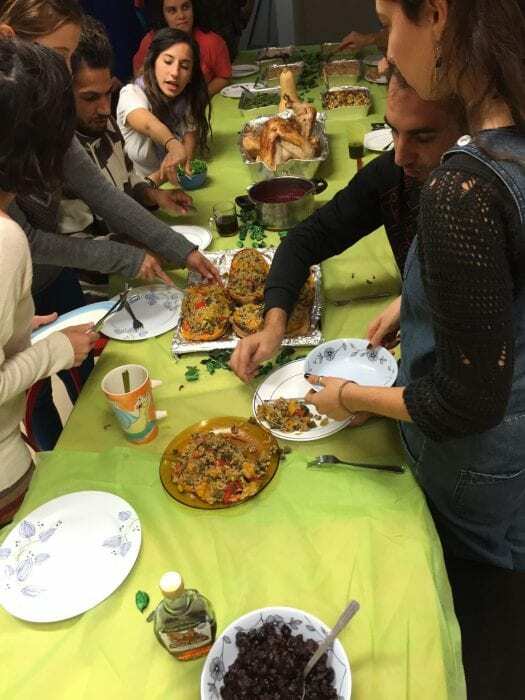 We love the wonderful mixture of dishes and flavors which make up the traditional Thanksgiving meal and the challenge of putting it all together on a kibbutz in the desert in the middle of nowhere. In addition to giving thanks and enjoying a wonderful meal, the American holiday is an important opportunity to reconnect with family and friends. This year, however, some people may be anticipating the holiday with trepidation. The current political discourse from gun control, to immigration, to health care to the Middle East has polarized communities and even families. You may not be looking forward this year to sitting at the Thanksgiving table listening to aunt Zelda’s opinions on immigration, or cousin Harry’s analysis of the Two-State solution. If this looming encounter with family or friends whose political opinions are different from your own is stressing you out, I would like to offer a few tips about how to have difficult conversations, which I have learned from our ongoing dialogues at the Arava Institute. For over 21 years, the Arava Institute, through our Peace-Building Leadership Seminar and other programs has been teaching Israelis, Palestinians, Jordanians and students from around the world how to have some of the most difficult conversations on some of the most sensitive subjects here in the Middle East. Anticipate when a conversation is going to be sensitive. Emotionally charged political conversations are a lot like driving on ice. As you hit the ice, the car starts to swerve and your initial reaction is to turn the steering wheel against the swerve, only causing the car to spin further out of control. While driving on ice, as when entering a sensitive conversation, you must suspend your instant reflexes, which usually serve you well. In the case of driving on ice, you must turn into the swerve, in the case of a difficult conversation you should give space to the other side to be heard. Deeply listen to the other’s argument or opinion which may run counter to your own. While listening, do not fill your head with your counter argument, drowning out what the other person is saying. When the other is finished expressing him or herself, suppress the urge to offer your quick counter argument. Instead, repeat the other’s argument in your own words, making sure that you really understand your aunt’s or cousin’s argument and showing them that you really heard them. When you do offer your counter argument, show empathy for your family member’s or friend’s point of view. Express an understanding of his or her opinion and give credence to those parts of their argument with which you might agree. Be sure to show respect when disagreeing. Do not disparage another’s opinion, and accept the fact that people can have different points of view about the same events or “facts”. Express your opinion from your personal space. In the end, remember that, we are all family and friends. At the Arava Institute we often say that trust is the scarcest resource in the Middle East. On Thanksgiving, the scarcest resource at the dining room table is crust. When you and your cousin Harry are both eyeing that last piece of pumpkin pie, perhaps you should consider to compromise and share that wedge of deliciousness. This could be a metaphor for compromise and sharing of other larger wedges in the universe.